Plan the Vacation You Deserve! Welcome to Chalet Village, the premier destination for Gatlinburg Cabins. 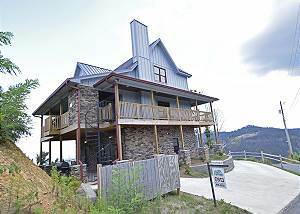 With over 40 years of experience providing Gatlinburg cabin rentals, our staff is committed to helping our visitors choose the very best Gatlinburg cabin or chalet to satisfy your vacation expectations. Let us help you plan your Gatlinburg vacation. Have you waited until the last minute to plan your Gatlinburg getaway? That’s okay! We have many cabin rentals still available for your vacation. Wouldn’t Gatlinburg be the perfect place to spend your family vacation? Our properties have great amenities to keep the whole family entertained, ranging from hot tubs to fireplaces to theater rooms. Or, take a romantic summer escape with your sweetheart when you stay in our romantic honeymoon retreats! You can even bring your dog when you book our pet friendly cabin rentals. Also, we have plenty of great deals for the season on our specials page. Gatlinburg is a beautiful destination because of our scenery and available outdoor activities. Take a hike at any of the area’s extremely popular trails, or mill around town where the shopping and dining choices are out of this world. Or, simply enjoy the spectacular sunsets from your deck or porch. Chalet Village is a family and pet friendly Gatlinburg cabin destination that also specializes in Gatlinburg honeymoon cabins. In fact, Gatlinburg is in the top 5 honeymoon destinations in the country! While on your Gatlinburg vacation, guests can enjoy fully furnished cabins, on-site amenities like a sauna and tennis courts, and close proximity to the very best Gatlinburg attractions. There is no shortage of entertainment in the Smoky Mountains, so be sure to check our concierge page to find and plan all the things to do in Gatlinburg. Keep up-to-date with what’s happening at Chalet Village and around the Gatlinburg area. If you are interested in renting one of our properties, you can use our advanced search to browse all of our cabin rentals or call us at 1-800-262-7684 to speak to a representative.